This is a series of 3 articles that highlight what Mark Manross learned from interviewing and testing kids about the skill of overhand throwing. 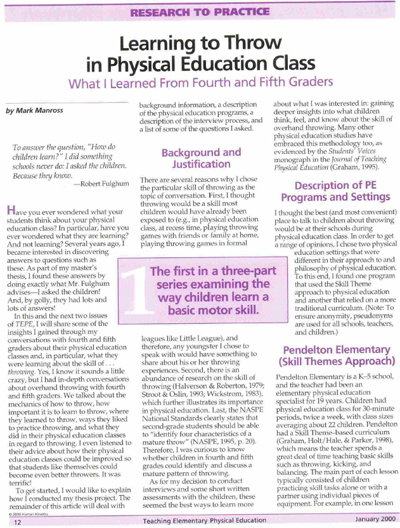 These 3 short articles were published in Teaching Elementary Physical Education (TEPE) Journal in 2000. Download Article Now. The purpose of this study was to gather insights about the thoughts, feelings, and knowledge children had about the skill of throwing. Interviews, conducted with 54 children enrolled in two different schools, served as the primary data collection source. Information concerning their knowledge of the biomechanical throwing cues was gathered using a written test. The children were involved in two different physical education programs. 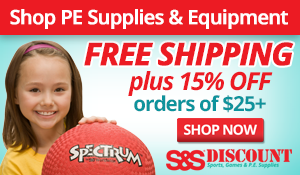 One physical education program was taught using the "skills theme approach" and the other used a "traditional approach." Questions guiding the study included asking the children how they felt about how they were learning to throw, what they liked and disliked about their throwing experiences in their physical education classes, and how important they thought it was to learn to throw. Children were also asked to describe and demonstrate the correct way to throw a ball. Assertions were formed using interpretive research. These assertions framed and organized the results section of the study. Results indicated that the children taught using the skills themes approach were more knowledgeable about the skill of throwing and they attributed their throwing knowledge to their physical education teacher. The children taught using a traditional approach showed little knowledge about throwing and they relied on others, not their physical education teacher, to teach them about throwing. Additional results revealed that all of the children said throwing was an important skill to learn and the way to improve throwing performance was to practice. Implications for teaching throwing are offered.